We Copples have continued to nurture children while teaching at MasterPeace Academy, as well as leading three after school kids clubs and a leadership training group for Avian Park teens. We took a road trip holiday to the Eastern Cape – much needed! After the winter school break (mid-June to mid-July), we arrived back at school to find not just two students, but six! Mpho continues to challenge us, since his mom has taken him off his ADHD meds, so he’s disruptive in class. Please pray for him. L-A has been leaning on God in teaching them art concepts that she did not learn in school, but they are keen. In one lesson for example, she taught about catching the right composition using viewfinders. It was a hit! We continue to be challenged with the kids clubs – in our Avian Park club, the numbers have reached as many as 80 kids! Thirty is much more sustainable in the library setting we are using. Some are just coming for the sandwiches and fruit, and bringing younger siblings. We’ve lost our Afrikaans co-leader so we are managing with simple English and halting Afrikaans. The teen leaders help. The founder of the ministry, Jan Buchanan has decided that we need to limit the numbers to a maximum of 40 by having a minimum age of 8. The highlight in this group so far was the Iris Harvest School 28 outreach team of 11 that came for one day. And what a day – we were primed for the Alpha Holy Spirit day within Youth Alpha. We invited the Holy Spirit to come and touch their lives, and between them the Harvest schoolers lead 13 children to faith alongside us! We even had enough sandwiches. Also, L-A has had some incredible God moments with individual children, even on bad days. Jesus is still in control, for which we, tante and oom (aunt and uncle) are thankful. We’re also blessed and challenged by the teens that are learning how to lead Bible studies on Saturdays within our home. They always come hungry: for love, sandwiches, fruit, juice, cake and selfies on L-A’s phone. They are cheeky and test our limits, but they know they are loved. Our other kids clubs in Riverview and Vinkrivier are challenging in other ways. Riverview meets outside in a courtyard, and it has been cold. Thankfully it has not rained during our time with them. Some of the farm kids at Vinkrivier are quite rough in nature and test us. It’s quite the love war, but Jesus wins. We are calling more of them by their names now, and L-A had a breakthrough one day when she and Tony led the group in leader Kaysha’s absence. Some didn’t want to participate in singing until we gave them homemade percussion instruments. They don’t want to just watch or listen; they want to participate. Some didn’t want to limbo dance, although those who did had a great time. But ALL of them wanted to join L-A in prophetic colouring. Previously, L-A had been working on one of her worship drawings, and was about to add colour. Holy Spirit nudged her to leave the drawings black and white and scan them so the kids could join in on worshipping God through art. What was amazing was the Holy Spirit fell on these kids and they were all quiet and happily working for almost an hour! This was a first! We are thankful and are praying for more keys to love on these diamonds in the rough. L-A has also found other art opportunities. She has become bookkeeper to Change Makers Worcester, which is a Roodewal township ministry that rehabilitates drug addicts to become changed men in the Lord. Yet L-A also had a prophetic impression of their parent ministry, Kibbutz El-Shammah, that they were an oasis of living water and Father’s love to Roodewal. She made this impression into a drawing. Change Makers has now moved to the opposite end of the township (thanks to a God-connection through Tony and South Africa Child Welfare). We believe the two ministries will be used as a canopy of love over this despairing neighbourhood. L-A gave the drawing to the founder of the Kibbutz and Change Makers, Erena van de Venter who loved it and had it framed. L-A has also been invited to enter three pieces of worship art in an upcoming Christian arts festival in October. Two appropriate pieces are finished so far. Here’s a look at some of the drawings with and without colour, and the gifted drawing. We are now running Alpha in the medium security wing of nearby Brandvlei prison on Saturday mornings. Part of our reason for coming to Worcester was because of this 1500 inmate institution. The first session was sharing and worship, with 12 men and two prison warders. We have so much favour with the men. Most are strong committed Christians, and two Muslims. Tony also shared about Alpha with Correctional Services executives on behalf of Alpha South Africa. Alpha would be running in every South African prison if there were enough volunteer leaders. We have continued our CWCP internet radio broadcasts, where Tony interviews different ministry leaders for our Worcester Reports show. L-A includes her Ways to Grow in God devotional segments, and often we have audio clips of children singing, and other music. You can find podcasts on the CWCP page on our website, coppleswesterncape.ca, under the ‘Listen’ dropdown. We took one week out for a holiday after the 2nd school term, and drove all the way to East London (with stays in different guest houses). We especially enjoyed connecting with Rachael and Josh Minter, who run an Iris Affiliate base in a former garden refuse dump in East London. L-A got to help serve lunch to the 500 resident Xhosas. The people were hungry for more than stew and bread. Josh has a gift of healing, so one resident approached us and wanted prayer for a nasty toothache. It was healed! We would like to visit them again. We had many God moments (which we wrote about on our Coppleblog page on our site). 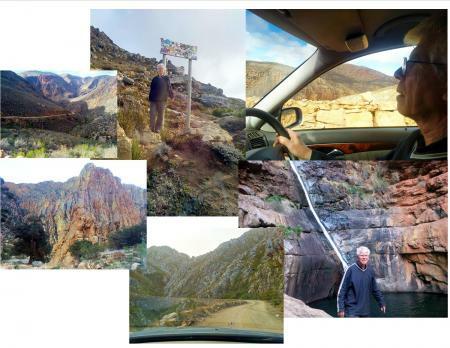 The other real highlight of our holiday was driving up the Swartberg Pass between the Little Karoo and the Great Karoo. It was spectacular and Tony enjoyed driving on the windy, gravel roads. Thankfully, L-A didn’t get the vertigo that she gets on other mountain passes. We are thankful for our holiday and for all the God moments of ministry and rest. We’ve now expanded Mama Heidi’s phrase from “Love looks like something” to “love looks like something everywhere.” We never stop being missionaries!